A lot of time has been spent covering the lives of history's most influential figures, but how much of the forest is lost for the trees? In Charles River Editors' American Legends series, listeners can get caught up on the lives of America's most important men and women in the time it takes to finish a commute. And they can do so while learning interesting facts long forgotten or never known. 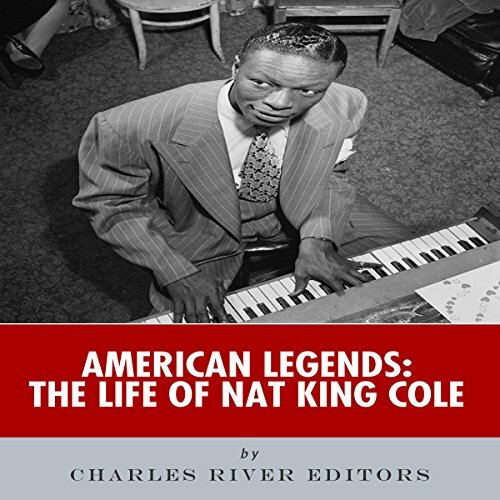 Among the most recognizable and iconic vocal artists known to American society from the mid-20th to the 21st century, baritone Nat King Cole is indelible in the nation's consciousness for such hits as "Mona Lisa" and "Ramblin' Rose" as well as for his rendition of Mel Tormé's famous "Christmas Song", with the opening line known to millions of American households: "Chestnuts roasting on an open fire." Cole is almost synonymous with the Christmas holiday season. His entire career, following an early start as a first-rate pianist, includes a consistent string of similar hits, including: "Route 66", "Sweet Lorraine", "(I Love You) For Sentimental Reasons", "Nature Boy," "Too Young", "Answer Me", "Walkin' My Baby Back Home", "Straighten Up and Fly Right", "Lush Life", "Those Hazy Lazy Crazy Days of Summer", "People", "That Sunday That Summer", "Dear Lonely Hearts", "L-O-V-E", and "Unforgettable". His gentle baritone sound, elegant phrasing, and crystal-clear enunciation are unmistakable, and have remained as a beloved fixture in America's collective ear for well over half a century. This short read,narrated nicely by Alex L. Vincent,lead us on a journey through Mr. Coles life and times.It was very interesting to me to see just how people of color were treated in the 'old days',even if they were talented.I enjoyed listening to his story. "The Christmas Song", "Route 66", and "Unforgettable" were a few of his most notable songs especially when Natalie accompanied him posthumously in "Unforgettable." He was a jazz pianist and went into the pop genre and began a parallel career. He was considered the African-American counterpart to Bing Crosby. He was also in several films. I grew up listening to Nat King Cole and I think we had all his albums. He was my dad's favorite artist. This audiobook was a great listen and was extremely moving as I didn't know he had been attacked for the color of his skin. I never knew this and learning of this made me cry. This was a man who brought so much joy into the lives of so many people. Alex L. Vincent did a great job narrating this audiobook. He spoke clearly and had a good pace as well as a nice tone. He made this a nice, pleasant listen. I would definitely recommend listening to this book. I wish it had been longer.